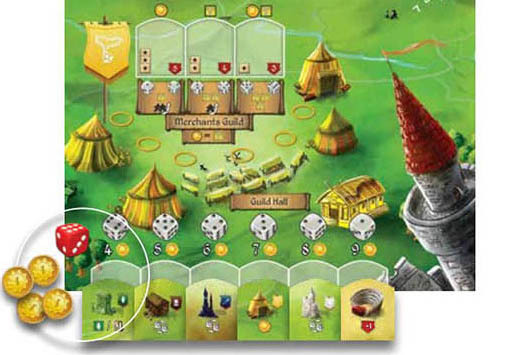 Some locations have a fixed number of available die slots no matter the number of players, while other locations have available slots based on the specific number of players. Instructions are listed on the Setup cards for each player count. One of your most important tasks is to house Caveborn's new Settlers. They will wait for you to pick them up in the Cavern Tavern. Dice are placed on the slots in order from left to right. The number of available die slots is equal to the number of players. The die placed in the first slot can be any value. Other dice must have a value equal to or higher than the previously placed die. 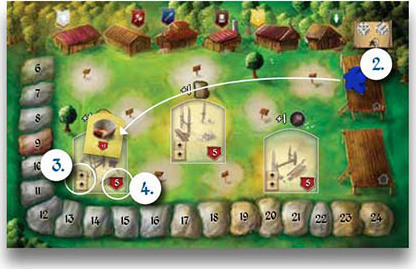 Example: Sara places a die of value 2 on Cavern Tavern and takes a Settlers card. Katie is next and she has to place a die of 2 or higher. She places a 3. Melissa is next and she needs to place a 3 or higher. She places a 6. 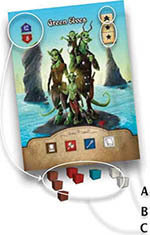 The Settlers cards represent the families and groups that have come to Caveborn looking for a better life. Each group has certain requirements (goods) they want for their house and a specific budget (Victory Points) they are prepared to spend for their accommodation. To complete a Settlers card you must: . Move a House from your Construction Platform to a House Lot on your Player Board. (ONCE moved, the House cannot be used for any other Settlers card). . Spend the Goods listed on the card by returning them to the general supply. When completing the card you must spend at least 1 Good of each type listed on the card, but no more than 3 wooden cubes per type. (YOUR Character card allows you to spend one extra Good of a certain type). The number of Goods you spend must fall within the minimum and maximum number of Goods required. 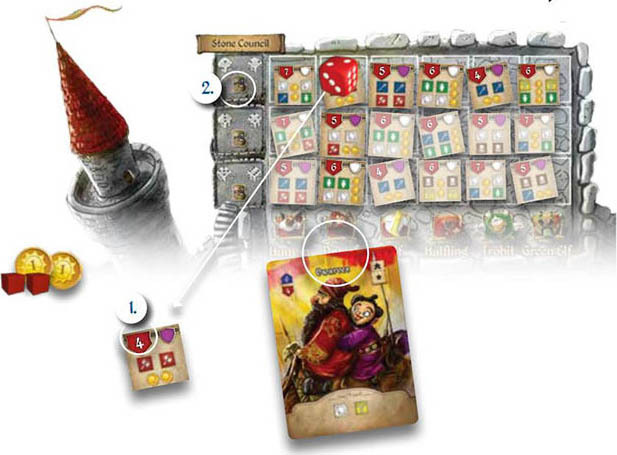 Gain the number of Workers (meeples) shown on the card and place them on your Workers Lot. Move 1 space up one the Nobility track for each star on the card (if any). Gain Victory Points equal to the number of Goods you have spent. Gain Victory Points from the Community Buildings on your land (if you have any). Do not discard your completed Settlers cards. Turn them or stack them in a way that the races are still visible. Some actions are affected by which races you have completed. You can hold up to 3 uncompleted Settlers cards. You can take a fourth card at Cavern Tavern and discard one of the 3 uncompleted settlers cards. There is no penalty for not completing a card. 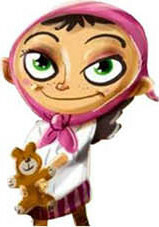 You cannot complete more than one Settlers card on your turn or complete the same Settlers card more than once. One of the requirements for completing a Settlers card is to have a House associated with that card. You can buy Houses at the Construction Yard. Other dice must have a value equal to or lower than the previously placed die. With each die placement, you can buy 1 House. Take a House of your color and place it on your Construction Platform. Example: Will places a die of value 6 on the Construction Yard and buys a House. Jonathan is next and he has to place a die of 6 or lower. He places a 3. Valerie is next and she needs to place a 3 or lower. She places a 2. At the Guild Hall, you can buy a Workshop or a Community Building. The Guild Hall has 6 die slots with a specific die value and cost associated with each slot. To purchase a Building, you must follow these dice placement rules: . 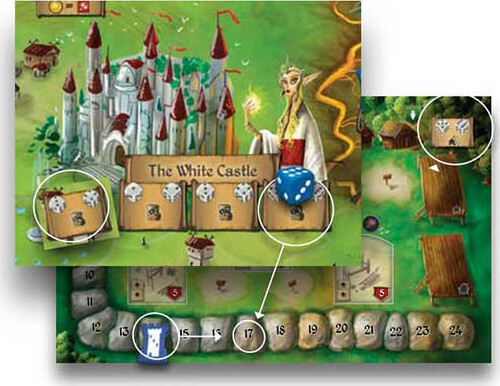 The die placed must match the die value shown above the Building tile. You must pay the cost shown above the Building tile. You must have the required Apprentice or Worker associated with the Building type. You must have the required Apprentice or Worker associated with the Building type (see the Buying and Placing sections). Purchased buildings are not replaced until the Upkeep phase. During the Upkeep phase, fill any empty slots by first moving the remaining Buildings to the left and then adding new Building tiles to the empty slots from left to right. If your Apprentices want to become Guild Masters, they must own a Workshop. Every Workshop is associated with a certain Guild, and can be placed only in that Guild. You can buy a Workshop only if you have an Apprentice (meeple) in the Guild associated with that Workshop. Place the Workshop in the corresponding Guild on the leftmost available Workshop slot. Place one of your Apprentices from that Guild on top of it to claim ownership of the Workshop. Move as many spaces up on the Nobility track as there are stars on the Workshop slot. Gain the Victory Point reward shown on the Workshop slot. The meeple you place in the Workshop becomes a Guild Master and is no longer an Apprentice. You immediately stop receiving Apprentice benefits from that meeple. The Guild Master does not earn you Coins during the Income phase. The Guild Master does not give you extra Goods when you buy Goods. The Guild Master earns you a Good from its Guild during the Income phase. During the Income phase receive 1 Good (matching the associated Guild) for each Workshop you own. When adding new Building tiles to the Guild Hall at the end of the round, discard and replace any Workshops that are associated with a Guild that already has all 3 Workshop slots filled. 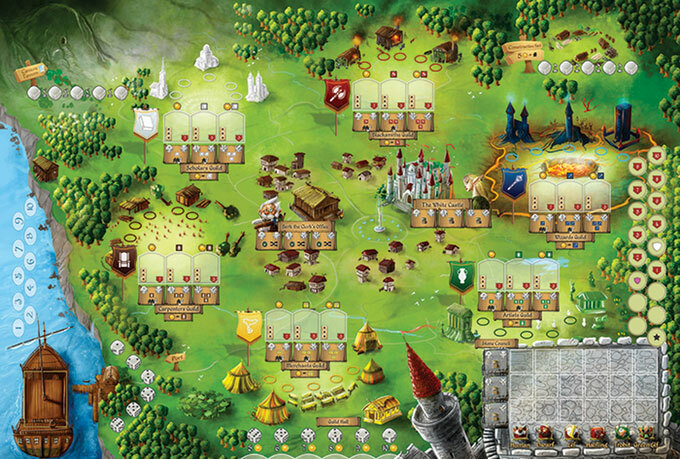 Community Buildings increase the value of your land and score extra Victory Points when you complete Settlers cards. You can buy a Community Building only if you have a Worker (meeple) on the Workers Lot of your Player Board. Place the Community Building on any empty community lot on your Player Board. Place a Worker from the Workers Lot on top of the Community Building. Move 2 spaces up on the Nobility track (as shown by the stars on the lot space). Gain the 5 VP reward shown on the lot. During the Income phase receive the reward shown above your built Community Buildings. On your turn, you can sell a building as a free action. This action is not associated with a location in the city or a specific die placement. Lose the VP you gained by placing the Workshop. Return your meeple to the Workers Lot in your Player Board. The Workshop stays in play but it is ownerless. No one receives the ownership rewards when a player activates that Workshop. Traders from all over the Five Realms come to Caveborn to trade and sell their Goods. You can sell Goods you've gathered by placing them on the Ship tile at the Port. There are 6 available slots on the Port with a dice value required from 1 to 6. The value of the die you place, determines how many Goods you can sell. You can choose any combination of Goods to sell. 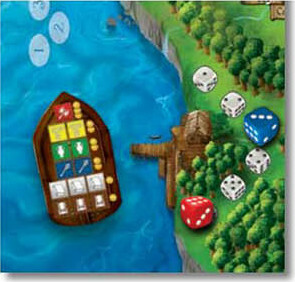 The Ship tiles represent the current demand for Goods in the City. Place the Good (wooden cube) on top of the matching icon (it must be empty). Immediately gain the amount of Coins shown on the tile. 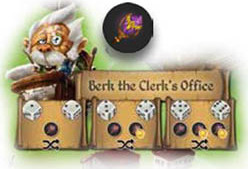 Example: Brian places a die with the value of 3 and chooses to sell 1 Jewelry, 1 Magic item, and 1 Furnishing. He receives 3 Coins for the Jewelry, 2 Coins for the Magic item, and 1 Coin for the Furnishing. Goods remain on the Ship tile until the end of the round. Once the spaces for a type of Good are filled, players may not sell any more of that Good. During the Upkeep phase, return sold Goods to the supply and place a new Ship tile in the Port. Six Councilors, one from each race, sit on the Stone Council. 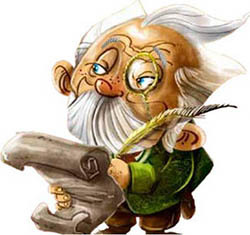 The Councilors' primary responsibility is to ensure that their races have enough Goods and Coins to prosper in the city. The demands of each Councilor are represented by Stone Council tiles. When you do business with a Councilor, you will be rewarded. But the other Councilors will resent your display of favoritism and your reputation in the city and with the High Queen will suffer. You must meet 2 criteria in order to do business with a Councilor. You must be at the same level or higher on the Nobility track as the nobility requirement indicated on the tile. You must have housed Settlers from the same race as your chosen Councilor. There are three available slots in front of each Councilor, 1 slot per row. You must meet the 2 criteria for doing business with the Councilor. The die must correspond to the die value shown on the tile's row. Take the tile and place your die in the tile's spot (not on the die-value slot). Immediately spend the listed Goods and Coins (if required). Gain the VP listed on the tile. Go back 2 spaces on the Reputation track. During the Upkeep phase, add new Stone Council tiles to the empty spaces starting with the top row from left to right. If you place a die with value 1 or 2, you can take one Modifier token for free. If you place a die with value 3 or 4, you can take one Modifier for free and choose to buy one Modifier for 1 Coin. If you place a die with value 5 or 6, you can take one Modifier for free and choose to buy up to two Modifiers for 1 Coin each. 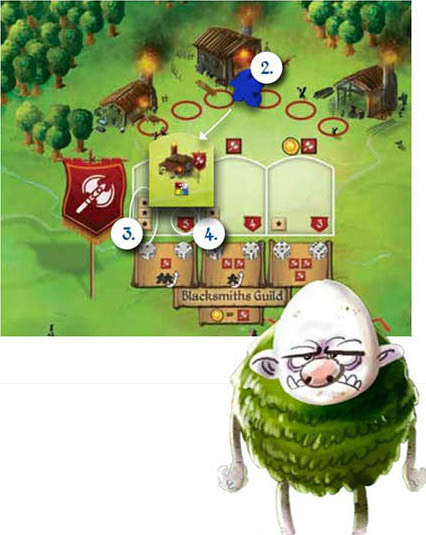 OR discard the Buildings from the Guild Hall and replace them with new Buildings from the bag. Place new Buildings from left to right, excluding the Building slots already filled with a die. It's very important that you keep your reputation and your good name if you want to be the head of the Stone Council someday. The best way to do that is by visiting the White Castle to maintain your relations with High Queen Tabita. All three die slots are available at every player count. When you place your die on a slot, you immediately increase your Reputation by the amount indicated. Your new dice value limit takes effect immediately.